Meta rears its head again, thanks to recent discussion on the thread that refuses to die. Short form, one commenter asked about the implications of space warps, and another pointed out that as magitech they are outside the scope of this blog. I've never formally defined the scope here, but in a practical sense it is surely true. In fact, regular readers here know that I am downright stodgy. (I told Orville, and I told Wilbur, and now I'm telling you - that thing will never work.) My justification is that at least the doors to space, orbit lift and basic space operations, are mature technologies. The space age is about as old, mature, and well established as commercial jets. And we have in fact achieved all the basic operational Cool Stuff, including building building a space station, keeping it in service over years, and test flights to the Moon, even if we did it in a contrary order. What keeps us from doing more of it is not technology but how expensive it has turned out to be. We've had that discussion before, and will no doubt have it again. There are other reasons for my bias toward Realistic [TM] technology. One of them - the underlying one, in fact - is aesthetics, which I will get to in another post. But another reason is that I like to play with numbers. Technologies 'indistinguishable from magic' are not very easy to quantify, or if you do, the numbers are equivalent to spell points. Magical and technomagic systems can and should mesh together internally, but their rules are as arbitrary as the rules of football. Which is why those arguments about Trek versus Star Wars are like arguments about why World Cup teams never go for a touchdown. Torch drives are another matter. I have always been partial to torchships, from the evocative name to the plausible implied physics. 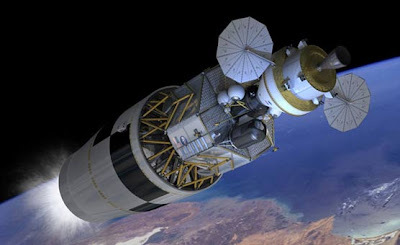 A torch is conceptually a rocket engine, just using some high energy reaction such as fusion. Yes, controlled fusion has been 20 years away for 60 years, but it is hardly magical to suppose that by 2100 or so, after 150 years of trying, we might get the hang of it. Setting surface lift aside, let's look at travel performance from low Earth orbit. We will reach escape velocity about 15 minutes after lighting up, a good Oberth boot, but with this ship it hardly matters. Suppose half our departure mass is propellant, giving us about 180 km/s of delta v in the tanks. Since we must make departure and arrival burns, our transfer speed (relative to Earth) is about 90 km/s. How much power output does out modest torch drive have? The answer, skipping simple but tedious math, is not quite half a terawatt, 450 GW. This baby has 600 million horses under the hood. That's effective thrust power. Hotel power for the hab is extra, and so is getting rid of the waste heat. The good news, for practical, Reasonably Fast space travel, is that we don't need those near-terawatt burns. They don't really save much time on interplanetary missions - we could reduce drive power by 90 percent, and acceleration to 30 milligees - the acceleration of a freight train - and only add three days to travel time. A classic brachistochrone orbit, under power using our full delta v, takes a week and carries us 270 million km, 1.8 AU. Add a week of coasting in the middle and you're at Jupiter. Saturn is about three weeks' travel, and you can reach distant Eris in 6 months. Do not try this trick at your homeworld. I don't know whether Heinlein never checked this calculation, did it and ignored the results, or did it and decided that a few dozen gigatons - 12 torchships are launched, one after another - was no big deal since it was off in the middle of the Pacific somewhere. You don't need full Heinleinian torchships even for fast interplanetary travel, but there is another side to this whole discussion. Over a couple of hundred years, the era I've been calling the midfuture, would we really expect the propulsion technology to remain essentially unchanged? But directly in front of the gate hardly half a mile away was a great ship that he knew at once, the starship Asgard. He knew her history, Uncle Chet had served in her. A hundred years earlier she had been built out in space as a space-to-space rocket ship; she was then the Prince of Wales. Years passed, her tubes were ripped out and a mass-conversion torch was kindled in her; she became the Einstein. More years passed, for nearly twenty she swung empty around Luna, a lifeless, outmoded hulk. Now in place of the torch she had Horst-Conrad impellers that clutched at the fabric of space itself; thanks to them she was now able to touch Mother Terra. To commemorate her rebirth she had been dubbed Asgard, heavenly home of the gods. Sometimes you just have to be propelled by the sheer power of cool. And what could be wrong with that? I stumbled across this delightful image on a Russian Livejournal, someone who calls himself Lord K. The overall theme seems to be 20th century images, most but not all of cool techno stuff. I do not know the date of this ad, though I'll guess late 30s or 40s from the design of the locomotive, which looks much like spaceships illos of that era at Atomic Rockets. Surely it is pre-1955, based on the monorail technology - resembling a conventional track, complete with ties, instead of the Alweg style, wrapped around a concrete girder on pylons, that Disneyland made the iconic image of Futuristic rail transport. Disney doesn't have to answer for monorails after all; obviously they were already with us, or would be in the Future. But whoever wrote the ad copy got something right. 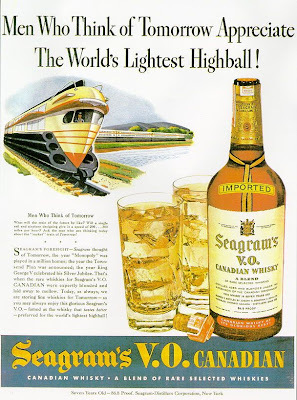 This was the dim and distant mid 20th century, when women apparently neither thought about tomorrow nor bought their own whiskey, but 'men who think about tomorrow' were thinking of trains going 200-300 mph. Trust me, though - it is a lot simpler with two rails, especially for switches AKA turnouts. 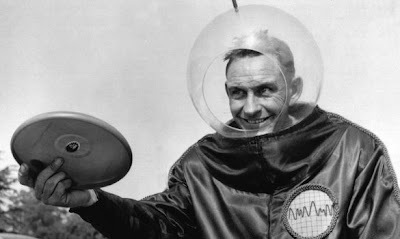 The inventor of the Pluto Platter, better known as the Frisbee, died a few days ago. (I read about it in the dead tree LA Times; the link is to a paper that was famous at one time.) I remember calling frisbees 'flying saucers' before I knew their official name. Fred Morrison invented them in 1957, appropriately in the rocketpunk era, hence this wonderful period image. In honor of the surprisingly graceful game of stoners' football that this technology made possible, consider this an open thread, a handy home for spin-off discussions that don't quite fit previous posts. Pluto may have been stripped of its full planetary epaulettes, but not of its ability to deliver surprises, and 'new' images from the Hubble delivered one. (Commenter Ferrard Carson alluded to this in a comment to the last post.) Pluto is undergoing seasonal changes on its surface, and with startling abruptness, considering that Plutonian seasons are about 62 years long. UV light from the Sun breaks up methane ice, leaving a dark sludgy stuff called tholin. The methane ice and tholin put me in mind of Pluto in Heinlein's Have Spacesuit, Will Travel. 'New' is in scare quotes because the Hubble imagery was obtained in 2002-2003, but it has taken until now to process the information - far below the nominal resolution even of the Hubble - to tease out the information. The level of detail they were able to recover, as a rather charming aside, is comparable to our naked eye view of the full moon. Evidence of surface changes comes from earlier Hubble imagery dating back to 1994. So Pluto now joins Earth and Mars among planets bodies whose surfaces change dramatically as a result of seasonal changes in surface ice. Though from another perspective this behavior is also a bit comet-like, a reminder that the displaneting of Pluto, however much it crushed schoolkids (most got over it), was a byproduct of all we are starting to learn about the outer Solar System. Instead of being the end of the Solar System is the near shore of an entire realm, orbiting in the solar twilight, only just starting to be known. Related post: I contemplated the immense outer system last year. In early 21st century space news, the Obama administration has released its new NASA budget, and the moon has been placed on hold. 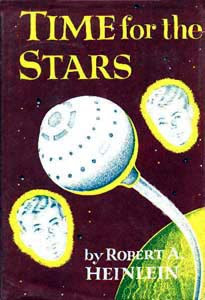 The entire 'Constellation' program has been scrubbed. Overall the new spending plan adds $6 billion, a modest 6 percent, to the NASA budget over the next five years. 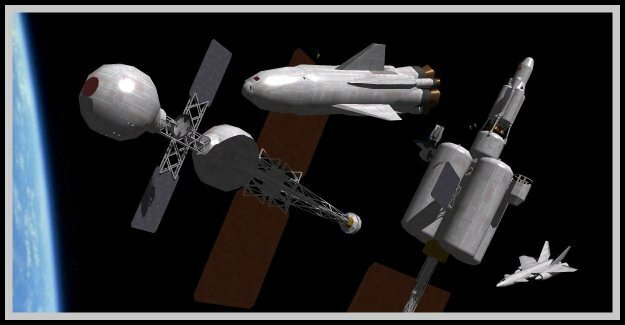 It puts more emphasis on technology development and (robotic, for now) deep space missions - and looks to the private sector for post Shuttle human orbit lift. So what should we make of this? Obvious disclaimer that I am unabashedly political, pro-Obama, and so would approve on purely terrestrial grounds. But I'll try to stick here to the space perspective. Constellation was eating the NASA budget. From the fairly little I know it became a classic boondoggle, a system that was supposed to be 'lean' and based on available tech, but ballooned out of hand. More fundamentally - and the likely underlying cause of its technical runaway - is that it presumed a time line out of synch with available resources. Did anyone really think we were going back to the Moon by 2020? The 'Murrican public has demonstrated its willingness to support a modest space program, about $20 billion/year. On that budget we can and have carried out a steady, ongoing reconnaissance of the Solar System, and expanded a standing human foothold in Earth orbital space. What you can't do on that budget is replicate Apollo (even with benefit of second generation technology) - especially if you also intend to do anything else. An interesting twist in the new budget is the element of 'privatizing' orbit lift. This is not so much privatization as such - US spacecraft have always been built by private firms - as a slap at the current procurement system and an opening to new players. I do not regard private enterprise as a magic drive, but shaking up a stagnant procurement culture might help and certainly can't hurt. This is no profound New Start for NASA and the US space program. But it is a credible, sustainable way forward in the long term enterprise of space. Irony alert: The image shows Constellation hardware that will be canceled under the budget plan. Related posts: I previously recommended skipping the Moon for now, though it has turned out to be more interesting than I thought.